•	Linkage between the exploitation of natural resources and the financing of illegal armed groups which reach all the way to Dubai and North Korea and include the purchase of a Boeing 727 aircraft originating at the Opa-Locka Executive Airport in Florida. The Security Council was scheduled to take up discussion of the final report on November 25, and when it appeared the report might be altered or scuttled, it was "leaked" (released) to every news organization on the planet. Considering that the United States, China, France, the Russian Federation, the United Kingdom and rotating member Uganda are all on the Security Council and all have been implicated in the report, it is no wonder the report was disseminated by rogues before it was dissected. Sources say China is especially eager to edit and delay the report and has demanded that it be translated into five additional languages before its "official" release. The "leak" turned into a tsunami as hundreds of news organizations declared an exclusive on this "new" information. The prose has been prolific about this report, which has flooded news desks the world over. Consider this, from the New York Times, which offered no in depth analysis of a nearly identical Interim Report, published last May. The lengthy report, which has not been made public but was provided to The New York Times, details a vast, rebel-driven criminal network in eastern Congo with tentacles touching Spanish charities, Ukrainian arms dealers, corrupt African officials and even secretive North Korean weapons shipments. The final document IS lengthy, 58 pages plus an Annex, all single spaced and containing an almost indecipherable data mother-load of individual's names, places, dates, serial numbers, and ship's manifests, many of which are in violation of international law and United Nations mandates and sanctions on arms trade and smuggling. The problem is that there is nothing entirely new in the report other than the deluge of specific names of countries and individuals who appear to be complicit in the ongoing humanitarian tragedy known as the Democratic Republic of Congo (DRC). The Interim Report, penned by the same panel of experts whose names appear on the "leaked" report, was made very public, and largely ignored by the international press. It is anyone's guess why this final paper chase has been seized as a revelation. Perhaps it is the covert nature by which it was distributed to the international press corps that got everyone excited. This is sad and unfortunate, because if the press had seized the opportunity to begin investigations last May, the world would be that much closer to understanding the scope of international involvement in the slaughter of innocents in DRC. 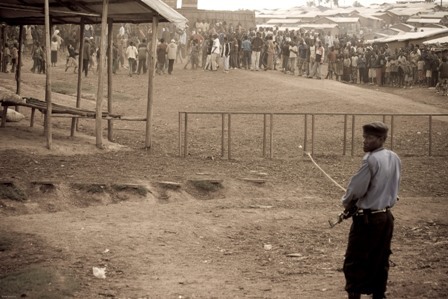 Human Rights groups, including OXFAM and Human Rights Watch have been relentless in presenting the humanitarian crisis engendered by the joint Rwanda/Congo operations which began in January 2009. But, this crisis has its roots in international exploitation of ethnic conflicts that go back over 100 years. In a well-reported July investigation, Global Witness reported that western mineral firms helped to fuel violence in the DRC. Global Witness names the same companies and countries mentioned in the "leaked" report. Belgium (Trademet, Traxys, SDE, STI and Specialty Metals), Thailand's Smelting and Refining Company, which is owned by the British company, AMC; the Malaysian Smelting Corporation, Berhad, China's African Ventures Ltd., India's Met Trade India Ltd. and Russia's Eurosib Logistics (JSC) are all part of the equation of non-documented transfers of mineral wealth. Al Jazeera has also been all over this story and the resulting humanitarian crisis. The innocent are relentlessly punished while international coffers grow fat. The US press has not done its homework. If they had, they would note that this report is an extension (December 2008 Security Council resolution 1857) of the mandate of the Group of Experts. The goal was to expand the investigation in order to expose individuals and countries supporting the armed groups currently operating with impunity through arms trades and illegal sales of natural resources. The final report gains even more importance with the realization that the deployment of the UN peacekeeping forces (MONUC) in the region ends on December 31 as stated in Security Council Resolution 1856. Now that the press has had a field day with this "leak," one has to wonder how much in-depth analysis will result. You cannot fight a war without weapons, and the money used to purchase the weapons must originate somewhere. The inventory of the weapons caches is extraordinary and includes UZI-submachine guns, hand grenades, AK-47s, 107 mm rockets, 82 mm mortar bombs, uncountable rounds of 12.7 machine gun ammunition and other arsenals. As the Huffington Post reported earlier this month, the Rwandan backed North Kivu Governor, Eugene Serufuli, is tied into this mess. Testimonies from five separate former FDLR combatants and three FARDC officers indicated that Col David Rugayi, formerly of the 14th integrated brigade, has been responsible for the diversion of large amounts of military equipment to the FDLR on several occasions in 2008, notably in February, June, October, November and December 2008 in the territory of Masisi and in the towns of Kalungu and Kibua. According to these testimonies, the equipment reportedly included hundreds of 107mm cannon rockets, a recoilless 107mm cannon, several RPGs, three machine guns of 12.7mm and 14.5mm caliber and two hundred boxes of 7.62x39mm ammunition (roughly 50,000 rounds), 230 AK-47s and several 82mm mortars. Col Rugayi, who is loyal to former Rwandan-backed North Kivu governor Eugene Serufuli, one of the founders of the sanctioned entity Tous pour la Paix et le Developpement (TPD), is also reported by three FARDC officers, interviewed by the Group to have taken charge most of the heavier weapons controlled by the predominately Hutu PARECO Mai Mai before their fighters were integrated into the FARDC. According to several military sources, Col Rugayi's 14th brigade was also heavily infiltrated by FDLR fighters when it was deployed in mining rich zones in the territory of Kalehe. The Group gathered several consistent testimonies from FDLR ex-combatants of Col Rugayi's involvement in exploiting cassiterite and gold in mining areas under the control of the FDLR in Kalehe, before the FDLR were pushed out of these areas by newly integrated FARDC units mainly composed of ex-CNDP elements. Armies also need a means to transport their weapons and there is not one region of the world that has not been complicit in supplying, trucks, tanks, trailers and aircraft in violation of UN sanctions and reporting procedures. Besides the Boeing 727 from Florida, the United Arab Emirates supplied three Antonov (AN) 12 aircraft for the DRC Air Force. The Ukraine supplied Mi-24 attack helicopters, Sudan sent arms on Hewa Bora's Boeing 707 (9Q-CKR), China offloaded 191 tons of weaponry from the An Xin Jiang, and North Korea provided FARDC with 3,500 tons of equipment and weapons shipped on the vessel, Bi Ro Bong. This is only a fraction of the shipments detailed in the report that the Security Council does not want the world to see. The aircraft was purchased for US$ 806,000 on 24 June 2009 by Mr. Timothy Roman, a U.S. national and former personal pilot of Joseph Kabila, from a company in Miami, Florida using an aircraft broker in Oklahoma City, Oklahoma. The Group was informed by an aviation industry source close to the deal that Mr. Roman purchased the aircraft for the Government of the DRC. The United States Federal Aviation Administration lists Mr. Roman's company, Professional Maintenance Services Incorporated in Hazleton, Pennsylvania, as the last owner of the aircraft, with the aircraft having been deregistered on 5 August 2009 because it was exported to the DRC. The Congolese Civil Aviation Administration (AAC) had no knowledge of this aircraft, and N-727YK does not appear in the AAC's most recent database. According to the testimony of sources and due to the fact that this aircraft does not appear on the civilian aircraft register, the Group believes that N-727YK was supplied to the Ministry of Defence upon arrival in the DRC. At the time of writing, the Group has been unable to obtain information on the sale and export of this aircraft to the DRC and requested further information from the United States and the DRC governments. The Group contacted Mr. Roman who said that the aircraft was sold by his company in Pennsylvania to Wimbi Dira Airways in the DRC, a company in which he serves as the chief executive officer. The report terms these transactions "opaque arms deals." The evidence presented above concerning arms flights from Khartoum to Kisangani and Kinshasa clearly shows repeated violations of paragraph 5 of resolution 1807 (2008) by the Government of Sudan. The Group requested information on the four flights in December 2008 and February 2009 but the Government of Sudan replied that no such flights had occurred, which is directly contradicted by three flight plans for these flights raised by Khartoum and transmitted to Kinshasa. The Group further requested that the Government of Sudan provide copies of logbooks from Khartoum International Airport as outlined in paragraph 7 of resolution 1596 (2005), but, at the time of writing, the Group did not receive a reply to this request. Most interesting is a section of the report which corroborates information that Rwanda and DRC were operating in collusion in late January during the ouster of Laurent Nkunda from the CNDP. This action installed wanted war criminal Bosco Ntaganda as a commander in the FARDC. The story involves a white Mi-8 helicopter and meetings between John Numbi, the head of the Congolese police (Annex 65) who managed Operation Umoja Wetu, and Major General James Kaberebe, the army chief of Rwanda. Kabarebe is alleged to have been the spokesman for Bosco Ntaganda in early contacts with the BBC in January when the toppling of Laurent Nkunda was announced prematurely. Both men are alleged to have masterminded the detention of Nkunda though bribes to war criminal Ntaganda in the amount of $250,000. The Group of Experts has investigated the operations of a white Mi-8 helicopter based out of Goma and requisitioned by the Congolese National Police (PNC). The white Mi-8 registered UR-HLC is owned by a Ukrainian company Khoriv-Avia but was leased to the Congolese Police by another company, Aerospace Consortium (FZE) in Fujairah, United Arab Emirates. This company leased the helicopter on 27 January 2009 to the Minister of Interior Security of the DRC represented by the Police National Congolaise (PNC) (Annex 64). The document is signed by John Numbi, the head of the Congolese police (Annex 65) who managed Operation Umoja Wetu along with Major General James Kaberebe, the army chief of Rwanda. Between the date of leasing and the helicopter's departure from the DRC on 10 June, it flew a total of forty flights out of Goma airport, with an additional two flights performed for the PNC prior to the signing of the contract. These flights, the last of which took place on 28 April 2009, were mainly listed as local flights within Goma but several aviation sources note that the genuine destination was hidden from the RVA. A source from the company that leased the Mi-8 informed the Group in writing that "most of the time the helicopter was used for the peace talks and evacuation of wounded personnel and shifting of Cargo [sic] from DRC to Rwanda and back". The Mi-8 performed eight flights from Goma in January 2009, fourteen in February, fifteen in March, and five in April 2009. In total, the helicopter performed twenty-one flights from Goma after the official end of Umoja-Wetu. Since the departures and arrivals of the Mi-8 are only listed as local flights, the Group cannot determine its exact routing in the DRC and Rwanda. 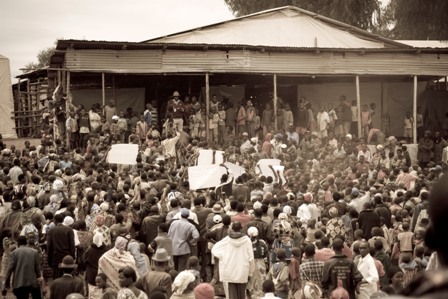 The local flight on 28 April 2009, for example, lasted four hours before the helicopter returned to Goma, and the flight on 22 April lasted six hours to and from Masisi, a destination that is approximately a fifteen minute flight from Goma. Ntaganda, the "Terminator," is now making at least $250,000 per month in his smuggling, timber, taxing and marijuana operations in and around Goma. There is so much more, and that is why I have uploaded the report for enterprising investigative journalists who do not have access. While MONUC was at the very least complicit to civilian casualties during joint military operation to drive out the FDLR, costs were escalating to over $1 billion per year. Spanish and Roman Catholic networks are supplying funds to the FDLR. During the initial phase, Operation Umoja Wetu, FARDC (Congolese Army) and RDF (Rwandan Army) commanders embezzled "several million" dollars. Why were Burundian officials in Malaysia trying to purchase 40,000 Steyer AUG assault rifles? Why is the United States building a new embassy in Burundi? Why is Rwanda still holding Laurent Nkunda in a sham detention, when the report and all others sources indicate the General is in regular contact with his loyal officers? Either charge him with something, or let him go. Nkunda has never denied that the mineral wealth of Congo belongs to the Congolese. CNDP sources tell us that "95 percent" of his forces remain loyal to him. As the report states, there has been no real "integration" of the CNDP loyalists into the Congolese army, unless you count CNDP traitor Ntaganda's "parallel command structure." What about the flow of refugees from Rwanda into Congo? Are they being forcibly conscripted? Why did the BBC not accurately report the violent protests in refugee camps in Rwanda during January when sources put them and their cameras on the scene? A Polish housewife, Ilona Jablonski, sent us photos of the demonstrations. Rwanda officials confiscated some of her film, but she managed to best the BBC. Finally, estimates are that 40 tons of gold is stolen from Congo every year, while official records indicate only a few kilos. Astonishingly, the means are as varied as regularly scheduled commercial flights and pirogues across Lake Tanganyika. Perhaps CBS will shed some more light on mineral smuggling during its Sunday "60 Minutes Report." Their investigation is no big secret.